It’s not uncommon for people to find driving at night stressful: visibility is limited and the field of vision is consistently high contrast. Aging drivers, in particular, have issues with decreased night vision and dealing with glare from street lights and oncoming headlights. 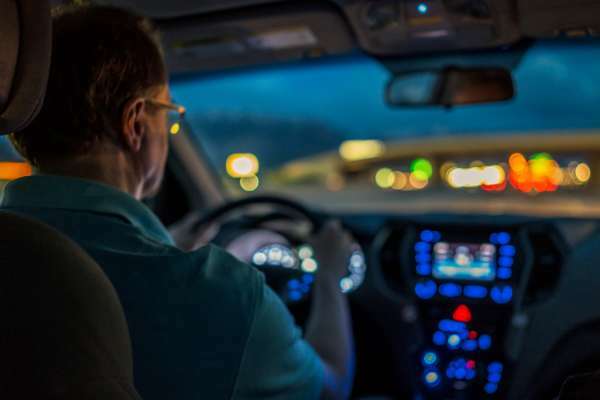 Driving at night safely is a concern for all of us, but the technology to make things better is usually left in the hands of car manufacturers. Zeiss is a name usually associated with high-end camera lenses, but they’re also responsible for an impressive range of optic lenses for vision care. Their Zeiss DriveSafe eyewear lenses have been created to make driving at night safer. Though the lenses are perfectly clear, you can see a purplish reflection on them. The Duravision Drivesafe coating reduces perceived glare by an incredible 64%, substantially more than other anti-reflective coatings. Glare from LED and Xenon lights, in particular, is reduced by DriveSafe lenses. The cutting-edge lenses have been designed around calculations of the increased pupil size during dark conditions experienced when driving at night. Notably, the lenses are available in single-vision and progressive lenses. And, the progressive lenses are definitely a step up from your standard bi- or trifocals. With standard progressive lenses, midrange areas — like the car dashboard and mirrors — aren’t in sharp focus. The Zeiss lenses are designed to give up to a 43% larger mid-distance zone so that glancing to the dashboard and mirrors is easier than ever. The straight-ahead vision zone (out the windshield) is 14% larger, providing a broader view of what’s down the road. With Zeiss Drivesafe lenses, keeping things in focus requires less movement or tipping of the head. The optimized progressive structure of the lenses is useful beyond driving—some users find it perfect for glancing down at their mobile phones, or for working at a computer. The lenses are excellent for driving at night, but also feel totally natural in the daytime; Zeiss had no interest in creating a lens that would have limited use. People hop behind the wheel whenever it’s necessary, and they don’t take off their glasses when they exit the vehicle. With these lenses, Zeiss continues to push the optics market forward and makes the roads safer for everybody. Take a minute to check out these informative videos, and be sure to talk to your local FYidoctors team about how Zeiss DriveSafe lenses could help you stay safer when you’re driving at night.